Ever come across a button on a website that says ‘submit’? They’re all over the internet. SUBMIT. It seems odd seen out of context like this, doesn’t it? That’s because it’s saying ‘give in’. That innocuous button is asserting its dominance over you. It sounds like you have no option other than to submit to its iron will. But that button isn’t the boss of you, no sir. You’ll never click that button – it has become battle to the end, and there can be only one winner. They’re known as ‘call to action’ buttons, and are typically found at the end of website contact forms. That button being clicked is the marketing objective for many websites. It means lead generation and therefore more business. So the button with ‘submit’ on is actually the most important element for many websites. It’s that final hurdle to generating a precious lead. If an unappealing proposition like ‘submit’ is presented, then the button is a call to inaction. It doesn’t compel people to click. It does the opposite. The ‘submit’ button is like a highly contagious virus – it has spread through the internet, defying logic. You’d think that such an important step in the business process would be more carefully considered. ‘Submit’ is neither creative, on brand or good marketing practice. Many designers and marketers are guilty of not thinking about people. More specifically, they haven’t considered how people relate to a brand when it comes to the details. And those details can have an impact on business. That all important ‘call to action’ button needs careful thought. It needs to relate to what motivates people to buy – the emotional connection which is so compelling. It isn’t something that should be overlooked. 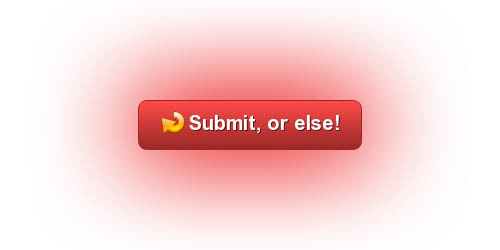 Our ‘Call to action’ button for a client. It’s enticing and shows their proposition. Your website design maybe usable, but does anyone want to use it? Does it connect with people on a human level with a compelling experience – or is it just more meaningless, nice looking fluff? That ‘submit’ button could be a symptom of a wider issue. If people don’t find your brand enticing, then they will be less likely to buy from you. And that could affect your conversion rate. To make your brand more enticing, you need to understand what motivates people to buy from your brand. Changing that button may make a difference to your conversion rate, but It’s the change of mindset that will really make a difference. This goes from your logo, images, and copy to your ‘call to action’ button. A newsletter signup for a client. The text is compelling and shows the value of clicking. Bring creative design and marketing together so that every single experience is dedicated towards people connecting with your brand. It can make an enticing proposition for people visiting your website which can help conversions. Hi, I’m Alex Hearn. Co-founder of The Big A. I help brands earn attention by blending creative design with marketing insight. I’m a contributor to Brand Quarterly & CreativePool, sharing decades of experience in the creative industry from traditional advertising to the digital world.